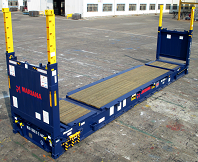 Container Specifications | Mariana Express Lines Pte. Ltd.
MELL maintains a modern container fleet that guarantees customers first-rate shipping services. We provide a wide range of equipment that caters to the exact needs of each customer. Besides the traditional 20-foot and 40-foot dry containers, MELL also offers the 45-foot and high cube storage spaces. MELL also focuses on providing specialized equipment, namely refrigerated containers in both 20-foot and 40-foot capacity, open-top and flat-rack containers as well as cement tanks. Tracking Get the latest tracking information on your packages. Get Schedule Your latest schedule information on when your packages arrive. © 2011-2019 Mariana Express Lines Pte Ltd. All Rights Reserved.